If you're trying to find the Lau Islands on your atlas, have a magnifying glass handy. The Lau Islands are the most isolated in the Fijian archipelago. Encompassing a vast stretch of ocean between Fiji's main island of Viti Levu and the Kingdom of Tonga, only about half of the 57 Lau Islands are inhabited (10,683 people according to the 2007 Census). Some of them are just small spits of sand fringed with coconut palms. 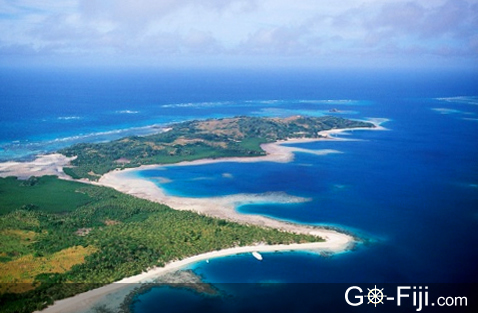 The entire Lau Island Group encompasses 487 km² (188 square miles) of land. The two main islands in the Lau Group – Vanua Balavu and Lakeba – are also the largest (52 km² and 54 km² respectively). These two islands are the two that are of most interest to outside visitors since they are the only ones that have visitor accommodations. Both islands are accessible by plane from Suva, as well as by boat (but the trip by boat takes a few days). Vanua Balavu is the main and most popular island of the Northern Lau Group. But the word "popular" is very relative because the island doesn't see more than a few hundred visitors a year. The island caters to people seeking peace and quiet or who are interested in hiking and snorkeling. Vanua Balavu is a coral and volcanic island (the southern portion is mostly volcanic and the northern area is coral). The island features views of steep cliffs and sea caves and has hot springs. Lakeba is the main island in the Southern Lau Group. The island's core is made up of volcanic rock with raised coral rock around it. It is known for its many limestone caves and cliffs, which rise up to 76 meters (250 feet) high. The island's interior also features views of hills planted with pine. Why visit the Lau Islands? If you've ever wanted to boast that you've been to a remote and tropical island, then a visit to the Lau archipelago will allow you to make this checkmark on your to-do list. These islands see very few foreign visitors and that's their biggest draw. One of the main reasons is that most of them are small, uninhabited and very remote and difficult to access. The Lau Group is for visitors who not only make it all the way to Fiji, but even then go out of their way and make the effort to make it to Lau. It takes time and planning to figure out how to get there and back. There are only two guesthouses in this island group (one on Vanua Balavu and one on Lakeba). But once you make it here, it's as pristine of a paradise as it can get - turquoise water, sandy palm-fringed beaches and traditional villages.